“Inspired by a bad docent – “I can do better than that”. And there are benefits. One of the better-known benefits of volunteering is the impact on the community. Dedicating your time as a volunteer also helps you make new friends, expand your network, and boost your social skills. This spring, volunteer training classes will be held for Pigeon Point Light Station State Historic Park (SHP) early in April, and for Half Moon Bay State Beach later the same month. While Año Nuevo’s training starts in the fall, applications and candidate screenings will start in April. PPLH Docents interpret marine life as well as the light station and the lens. 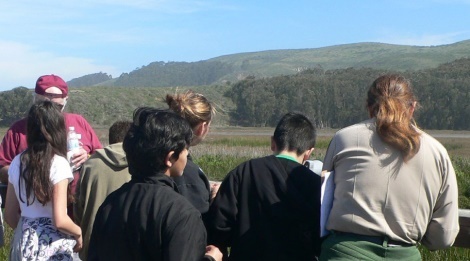 Año Nuevo docents interpret all aspects of the park year 'round. Pescadero Marsh is just one of the parks supported by Half Moon Bay area docents and volunteers. If you would like to learn something about one of your local state parks and then share that knowledge with both local and international visitors, please consider volunteering for parks.